It's been one HOT summer here in Florida, but that hasn't stopped us from finding time to hit the trails. We may end them hot and sweaty, but we end them happy! However, making sure you finish a trail with a smile on your face comes with a few essential components; at least for us! 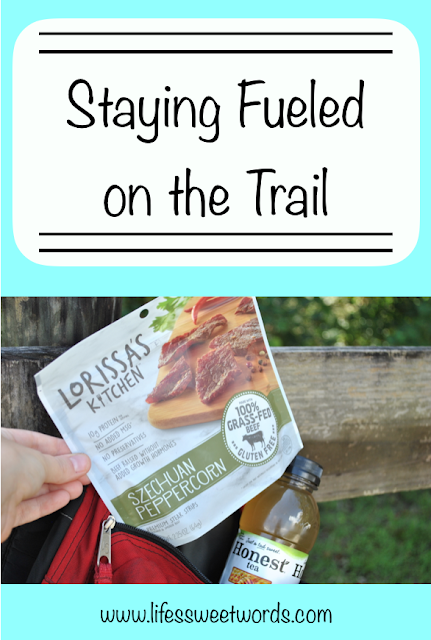 So, today I am sharing how we stay fueled for a full day of hiking. Water is an essential part of any outdoor activity and hiking is no different. Hydration is key to a happy hiker and water is crucial. We always bring along a few water bottles, in our backpack, and then use those to refill our tumblers as we walk. However, if you are anything like me, water alone won't keep you satisfied and happy. *Hydrating prior to a big hike is also super important. I try to make sure I am drinking water the day before, and on route to, our hike. I always pack at least one or two flavor-filled beverage items when I am on the trail. I use these to balance out the water drinking, so that I have something with me that I enjoy drinking. I love Honest Tea®! Their Organic Honey Green Tea is my favorite, as it is just a tad sweet, but so full of flavor. Honest Tea is super refreshing and that little added bit of natural caffeine keeps me going. That small burst of sugar also helps to keep me from running on fumes, as the sun beats down on us while we hike. Having something flavorful with me also encourages me to drink more water. I always tell myself that all I have to do is finish my water and then I can reward myself by filling up my cup with something "happy"! I am a big #treatyoself proponent and Honest Tea's Organic Honey Green Tea is the perfect balance to keep me hydrated for the miles ahead. If I haven't been fed, I can get REAL hungry hangry, REAL quick. Babe knows that the key to a happy time on the trail is keeping me well fed. We always have our eyes peeled for good places to stop for a snack break! What's the key to a good snack break? Good snacks, of course! When you are on the trail you need to load up on foods that are better for you, so we typically stick with things that are high in protein and not filled with tons of non-essential calories. Lorissa's Kitchen has the perfect snacking options for on the trail! Made with 100% grass-fed beef and no-added growth hormones, MSG or nitrates you can feel better about what you're eating. I LOVED Lorissa's Kitchen Szechuan Peppercorn, but there are a handful of other great flavors as well. Sitting down to enjoy a break, while nibbling on some of Lorissa's Kitchen premium steak strips and drinking Honest Tea, was the perfect combination to get us refueled to finish the trail. Plus, you've got to love a resealable pouch! Our Lorissa's Kitchen pack had enough to give us something to nibble on and something to save for later. Babe was actually able to finish the pouch off as a great on-the-go breakfast, on his way to work the next morning! Note: I found both the Lorissa's Kitchen pack and bottle of Honest Tea on the end caps of my Walmart checkout lines, making it super easy to grab both when you are on-the-go! Right now, you can earn $1.00 back through Ibotta, with the purchase of both products, at your local Walmart! Don't forget that after a long hike, your body is still recovering. We always make sure to keep some extra water in the car! That way, if we finished off what we brought with us on the trail, we have something waiting for us. With as many trails as we have hit this year it might be time for a hydration backpack, but we just haven't made the jump yet! What do you do to stay fueled on the trail? Any great snack options we should know about?! Yes, very similar; It's a bit more moist, but soooo good! Ahhh, I have always wanted to hike at Tallulah Gorge! We go so close every year (we do Georgia every summer), but always have my nieces and nephews, so staying closer to the house we stay at always wins out. Wonderful tips! It's always important to stay hydrated. That beef jerky sounds so tasty! Great choices for a hike. I've tried the jerky before and its pretty good! Great tips - I'll have to show my boyfriend, he's obsessed with hiking so this is helpful! Proper hydration is truly crucial, Melanie! These are some great ideas which I will definitely use on my next hike! October Currently and a Look at our Chaotic Life!